These 3-3/8" x 2-3/8" clear soft vinyl horizontal badge holders have a zipper closure that keeps dirt and moisture away from your ID card. The slot and chain holes allow you to wear these 3-3/8" x 2-3/8" badge holders with a lanyard, neck chain, or strap clip. Get 100 with every order. Product number MYBP506ZHKR. Transcript: These are Badge Holders with Zip Seals! 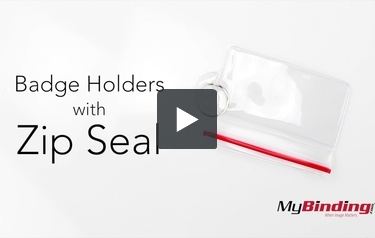 They work kind of like a plastic sandwich baggy, pull apart the zip seal and insert you card—though the seal is much stronger than a baggy. Push it back together to seal your card in. Here is a closer look at the zip seal, as this is the main selling point on this badge. As you can see, there is a red bar over where the seal is, and the rest of the badge is crystal clear. Out of my samples I only have the holder with the ring, but it comes with the standard slotted hole and chain holes. These are Badge Holders with Zip Seals! Or use a chain if that’s more pleasing.